As schools and classrooms become more interested, and invested, in blended learning, it’s a good idea to have a deeper understanding of the unique models that have the potential to support teachers in meeting the needs of a diverse group of learners. Our first post on a blended-learning model focused on Flex. In this post, we’ll look at another disruptive model, Individual Rotation. In this model, students can rotate through stations on individual schedules set by a teacher or software algorithm. What makes it different? Unlike other rotation models, students do not necessarily rotate to every station; they rotate only to the activities scheduled on their playlists. For example, if you were to walk into a classroom doing the Individual Rotation, it might look a lot like a Station Rotation model. The difference, however, is in the student’s experience. Each student’s learning agenda is tailored every day to his or her individual needs, based on his or her performance (which is typically recorded by an online learning platform) the previous day. When should you consider using it? Because this model is a disruptive model, and disruptive models generally are the most divergent from the traditional classroom, it can help to experiment with this design when a student’s current alternative to learning is nothing at all. In other words, we urge educators to launch disruptive models in non-tested subjects or courses otherwise not on offer at your school. Imagine leveraging innovation to finally personalize learning, extend access, and rein in costs in an otherwise resource-constrained system. Is it comparable to another model? While it’s not always the case researchers at the Institute often think of the Individual Rotation model as a hybrid of the Station Rotation model and the Flex model. 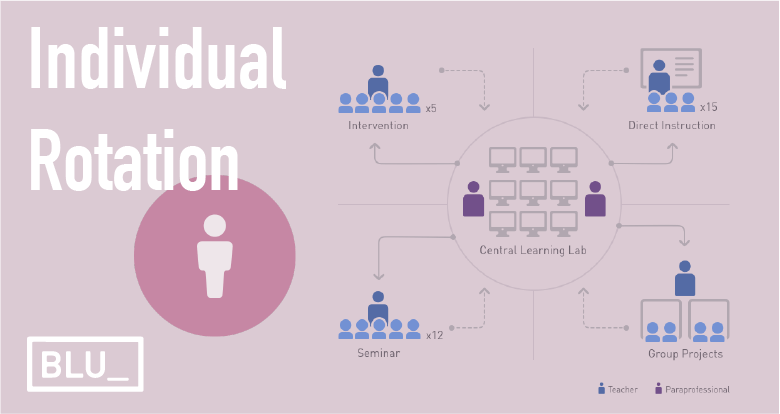 Over time, we do sometimes see the Station Rotation model evolve in classrooms to approaches that more closely resemble the Individual Rotation model, as teachers and students grow more confident with the blended-learning format and look for elbow room to customize to each and every student. Unlike in the Flex model, students in Individual Rotation still adhere to a common time block for learning. How are schools implementing this model? We examined the BLU Directory to discover three schools who’ve shared their journeys with the Individual Rotation model. In 2015, Bennie Dover Middle School partnered with the non-profit organization New Classrooms to replace its math curriculum with the Teach to One: Math personalized learning model. Every evening, the school’s math teachers receive a customized schedule for every student. This unique schedule is created by a sophisticated technology engine that powers the Teach to One model. The teacher assigns to students a lesson (from a library of 9,000 different lessons) and a modality based on a low-stakes assessment the student took earlier that day, along with analytics from historical learner patterns, individual learner attributes, and lesson characteristics. Teachers review the schedules in the evening and then meet for a morning planning session to refine lesson plans together. While some teachers may provide a lesson to a small group, others may support students one-to-one while they work on digital lessons, and other teachers may work with small collaborative groups exploring challenges via pen and paper or using manipulatives. Students usually rotate through two of nine available stations in the classroom during the 100-minute math block. In Teach to One, learning cycles last about three weeks. During each round, students have the opportunity to meet with one teacher and one group of peers several times to work on a project together. Students also have a Math Advisory group that meets regularly throughout the year with the same teacher. Teachers and students may track learning via their respective online portals. A unique Skills Library is created in the portal for each student and they can earn points and badges as they pass skills. Students may also work on their own by doing Prove Its or Watch and Learn Videos. Highland Academy’s approach to learning is predicated on student agency: giving students voice and choice in their learning. To that end, teachers work to create a learning environment in which individualization happens organically based on student ability and need. Depending on the day and the class, teachers will prompt students to access their personalized playlist in Empower, a digital platform that shows students the framework of their curriculum and provides support from teachers throughout each unit. Teachers can now differentiate with varying activities based on readiness. Like most schools in Horry County Schools, Myrtle Beach Middle School initially adopted a Station Rotation model. But as teachers became more experienced in blended learning, they came to realize that the flexibility of an Individual Rotation model would better support the diverse needs of their students. “In the beginning, we thought in terms of time: how many days per week are we going to do blended learning?” said Janice Christy, principal of the school. “Now, we think in terms of the instructional cycle: when is the right time for teacher-directed, whole-group instruction, and when is the right time for individual or small-group instruction based on student need?” When planning lessons, administrators and teachers also ask themselves whether online or traditional methods of instruction would be most effective. “Our model has changed, and will continue to change, as we become increasingly more sophisticated at using all of the tools at our disposal to move students along individual paths of learning,” noted Christy. Myrtle Beach Middle School’s instructional model begins by following a diagnostic pre-assessment at the level of the individual with teacher-directed, standards-based instruction. Teachers deliver formative assessment and then scaffold instruction through “personalized digital learning;” differentiation may occur in a variety of groupings based on student need, with some students working on online content, and some working with the teacher, some working on online content while being coached by the teacher, some working collaboratively, et cetera. As students reach mastery of the standard, differentiation wanes for some and intensifies for others who need more support. Teachers administer summative assessments, and the cycle restarts for the next standard. There are over one hundred schools in the BLU Directory implementing some form of Individual Rotation. These profiles cover a broad spectrum of schools across different geographies, community types, sizes, demographics and more. Explore the Directory to discover how the model is implemented in a school like yours. I teach 1st grade and I am trying to show my students the many technology opportunities they have to help themselves learn, grow in knowledge, and have fun investigating things that interest them. However the greatest challenge we have is the lack of updated, fully functioning computers. I can see the benefit of a blended model because then you can differentiate learning styles and levels. I don’t know how I could use it in my therapy groups but I think it is great for classroom teachers with many students. Using the individual learning rotation would be a great thing especially when the students don’t have to go to all of the stations on one day. I would like to try this and see it in my classroom.